I have decided to prepare some yam cake today to serve as snack for the family. There is slight changes in the recipes and as I was on a vegetarian diet, I have prepared the vegetarian version. Added some corn starch to the preserve radish such that it will not drop easily. 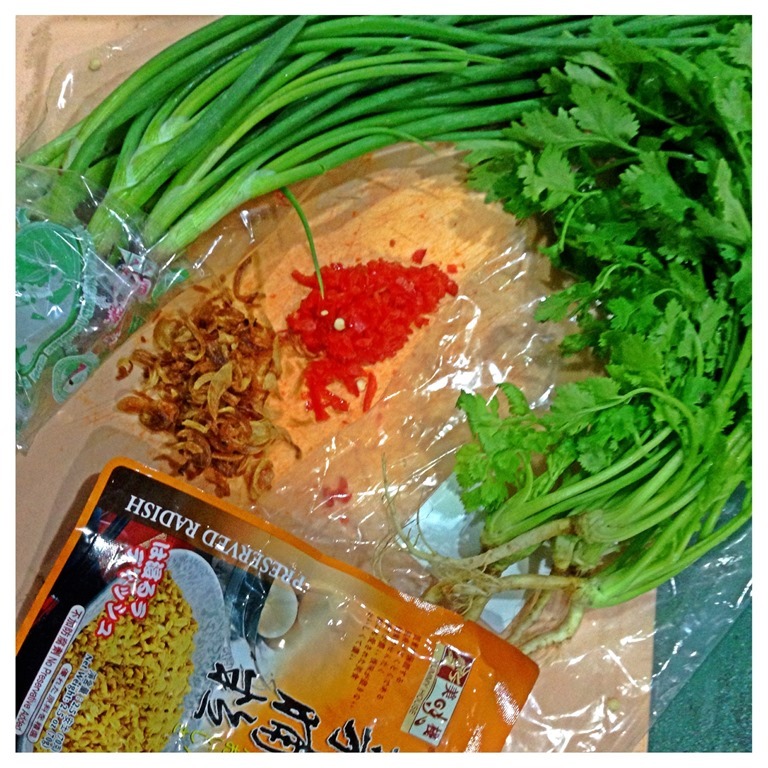 Omitted the use spring onion and substitute Chinese celery and coriander leaves. 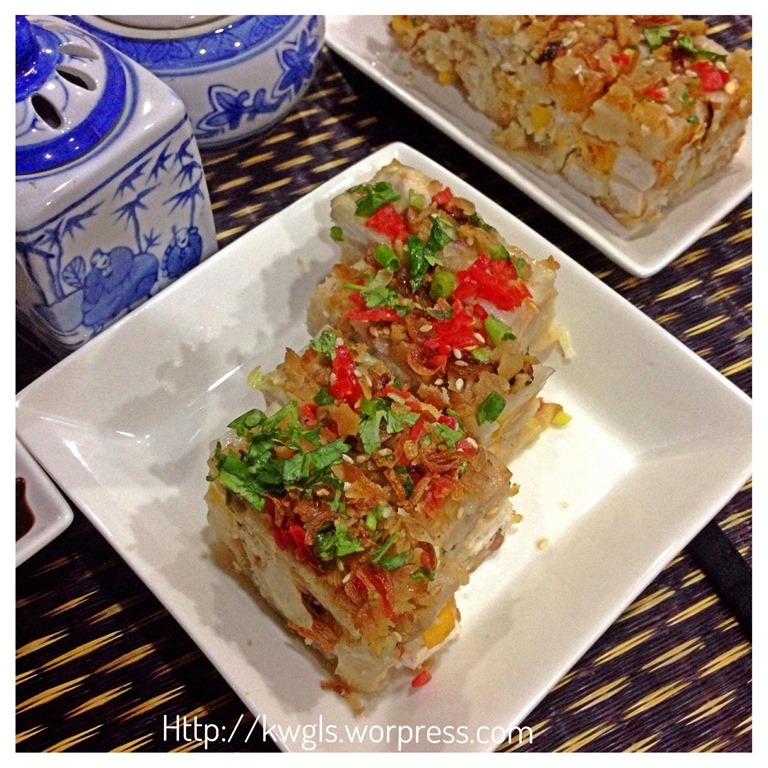 As a result of above slight changes, the texture is better and the preserved radish is less likely to drop. Hope readers can give it a try. 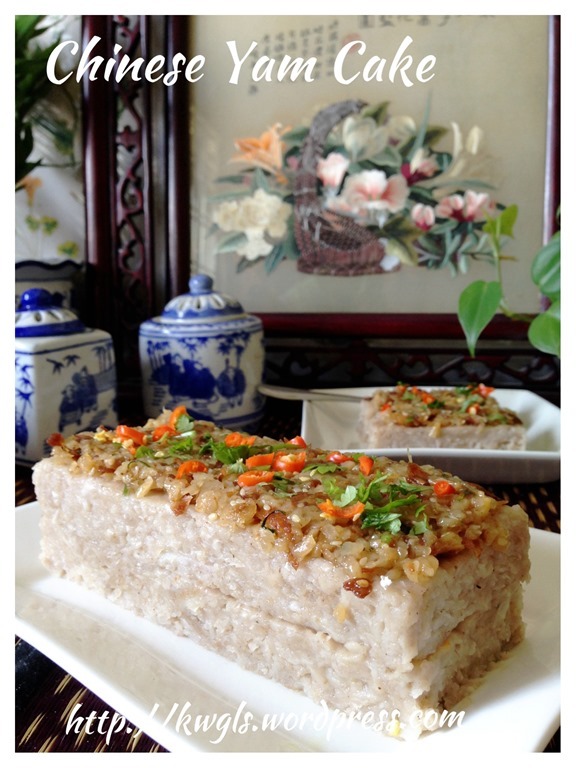 This is a Chinese steamed cake that brings fond memories. When I was young, the cake was prepared for offering to the ancestors and the recipe that I am going to share is the type of yam cake that my late mum used to prepare. Usually, the cake was savoury and usually prepared using yam, however, it can also be prepared using potatoes and/or pumpkins. In this illustration, I have combined both yam and pumpkins. Unlike, those sold at hawker centres that have more flours than yam, for this homemade yam cake, I have used more yam than rice flours. 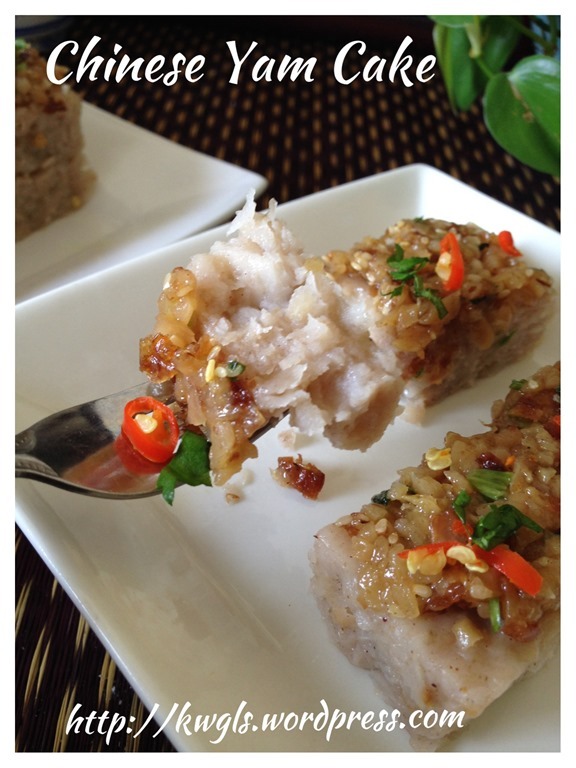 If you are a yam or taro lover, you will definitely love this special steamed cake. However, if you wish, you can reduce the yam and pumpkin quantity. If you have difficulty to get hold of taro or yam, you can only use pumpkin or even potatoes. 50 grams of baby shrimps or dried shrimps (soaked). If dried shrimps were used, chop roughly. Line a 20cm x 20cm x 5 cm baking tin with water proof parchment paper or any container that can fit your steamer. In a big sauce pan, put in 80 ml of cooking oil and stir fry the shallots under medium heat until the shallots are brown, Drain and set aside of later use. Use the same shallot oil to stir fry minced meat, baby shrimps and mushrooms. 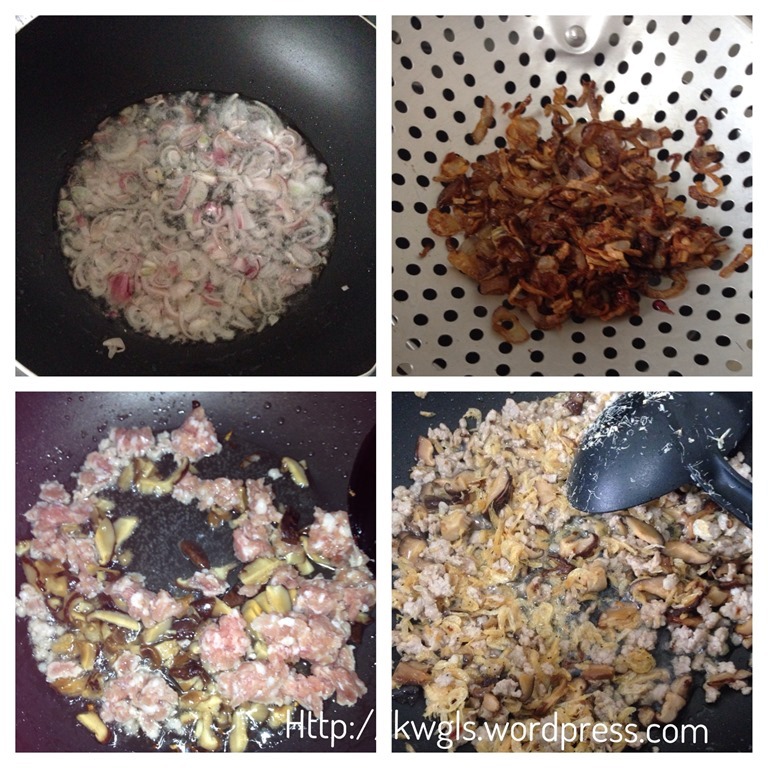 Stir fry until slightly brown and the fragrance of the dried shrimps and mushrooms start to spread. 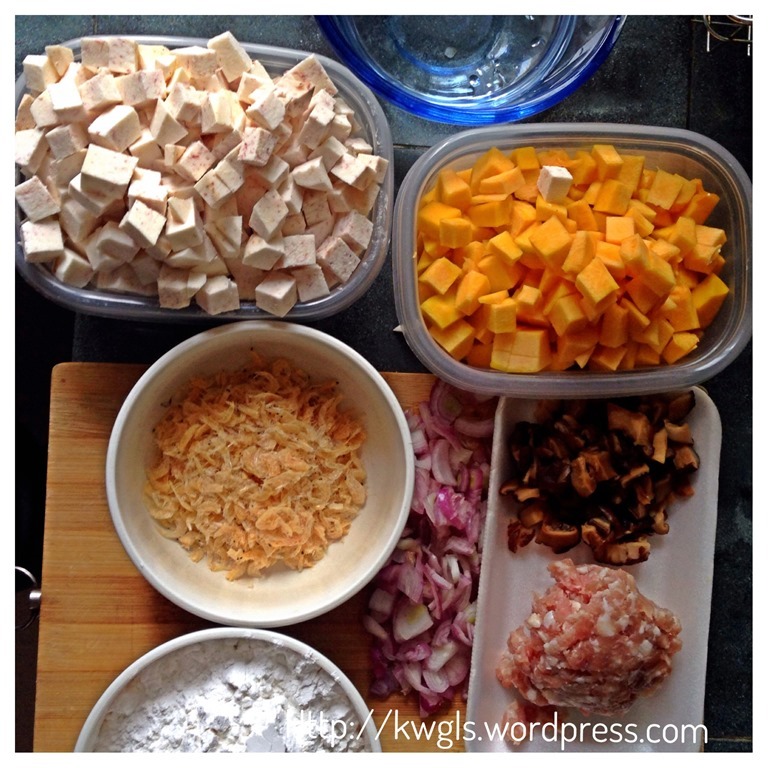 Add the yam cubes and pumpkin cubes and stir fry for 1-2 minutes. Off the heat. In a big container, put the rice flour, corn starch and meat broth or plain water. Add in half of the fried shallots, seasonings (salt, five spice powder, white pepper and light soya sauce). Stir well and add in the stir fry yams and pumpkins. Stir well and transfer to a 20cm x 20 cm x 5 cm baking tin (or any baking tin that can fit your steamer). Steam under high heat for 20-30 minutes or until a skewer inserted to the cake comes out clean. In a hot pan, stir fry the dried radish with 1 tablespoon of oil until the radish started to “jump up and down” on the sauce pan. Add one tablespoon of corn starch solution (1 tablespoon of corn starch with 2 tablespoons of water), cook for another one minute. Off the heat, cool and set aside. 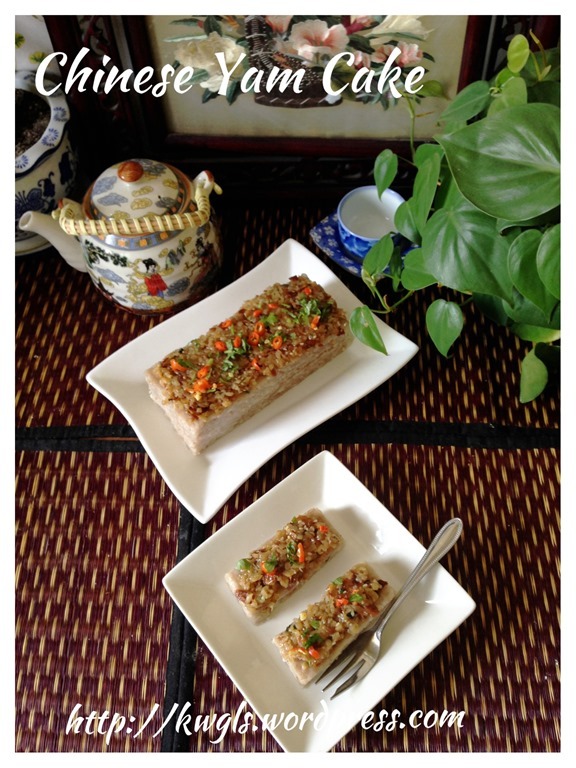 When the yam cake is ready, sprinkle the radish, sesame seeds, chilli, half of the fried shallots, chopped coriander leaves and use a spoon to slightly press against the cake. You have to do this earlier when the cake is still hot and moist, otherwise, the toppings will not stick to the rice cake and when you cut the cake, it will become very messy. Cut into the desired size for serving. 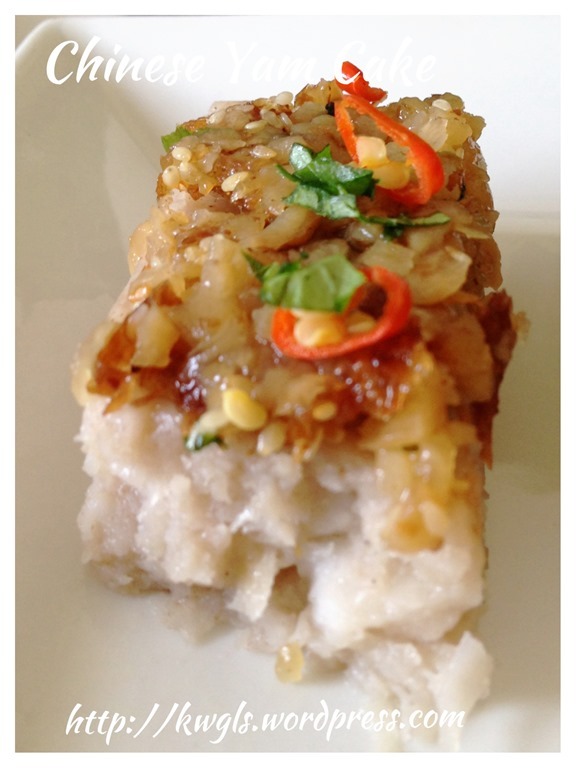 Best served with Thai sweet chilli sauce or sweet thick soya sauce. As some readers are asking if there is a need to cook the rice flour solution, as per this recipe, I did not cook the solution because my yam and pumpkin are a lot and flour are relatively less. Therefore, mouthful of yam when you eat it. 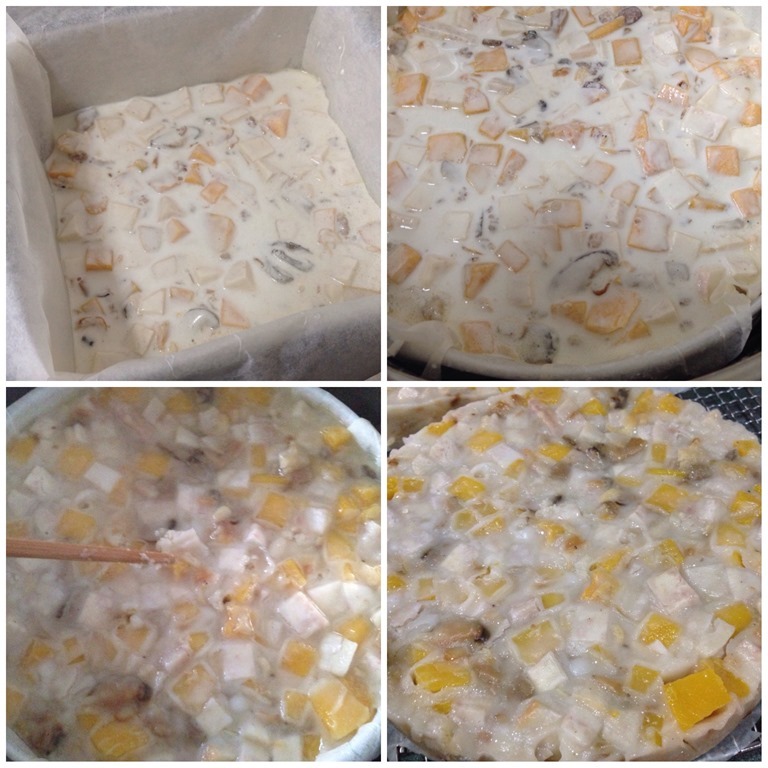 However if you have reduce the usage of pumpkin and yam, you may want to consider to cook the rice flour solution until it resemble a paste. Add in the yam and pumpkin and continue the procedures. 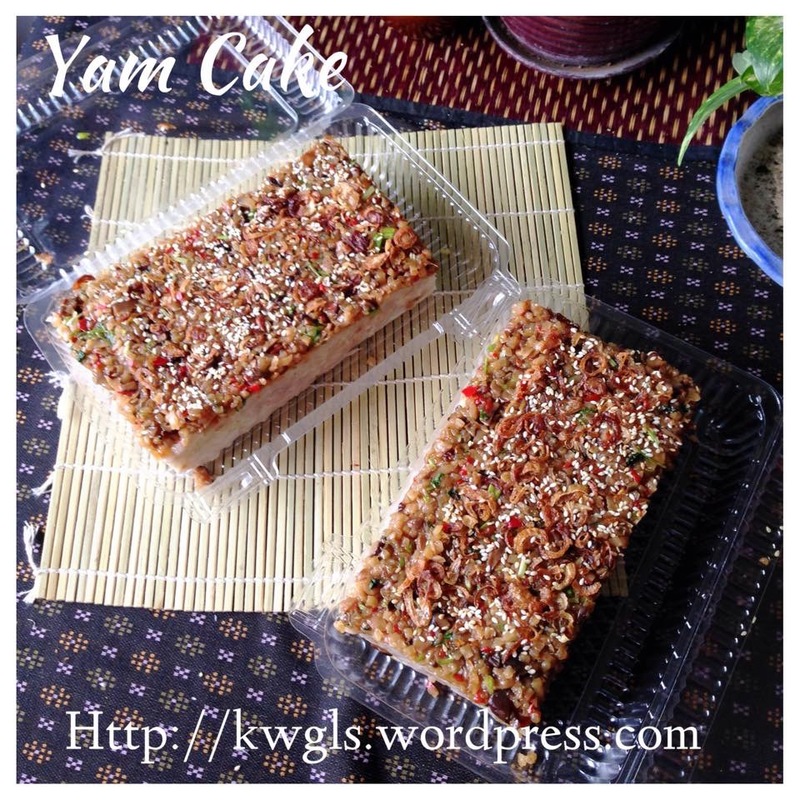 In this case, it may be softer than the yam cake shown in this recipes. 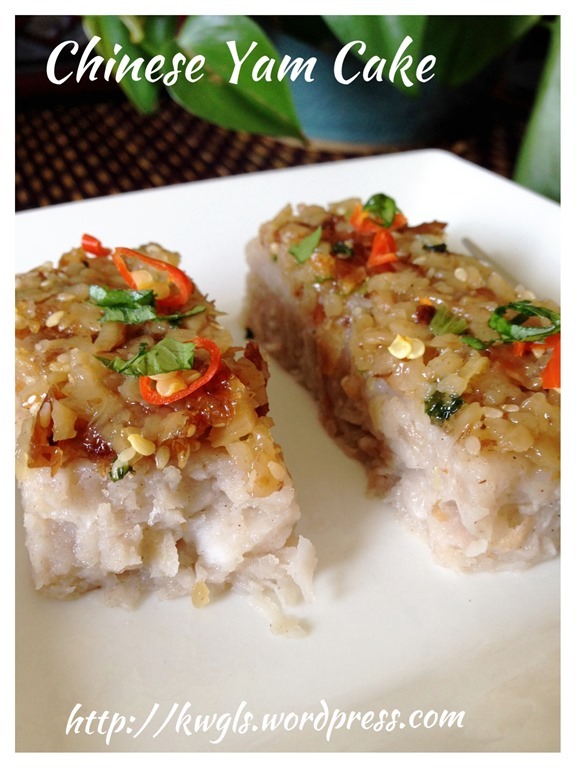 For this recipe, you can also cook the rice flour if you wish. However, I have opted not to perform this procedure. In the updated illustration of 4-9-2014, I have cook the rice flour solution and add to the yam until it resemble a paste. Transfer to the steamer tin and continue with the rest of the process. 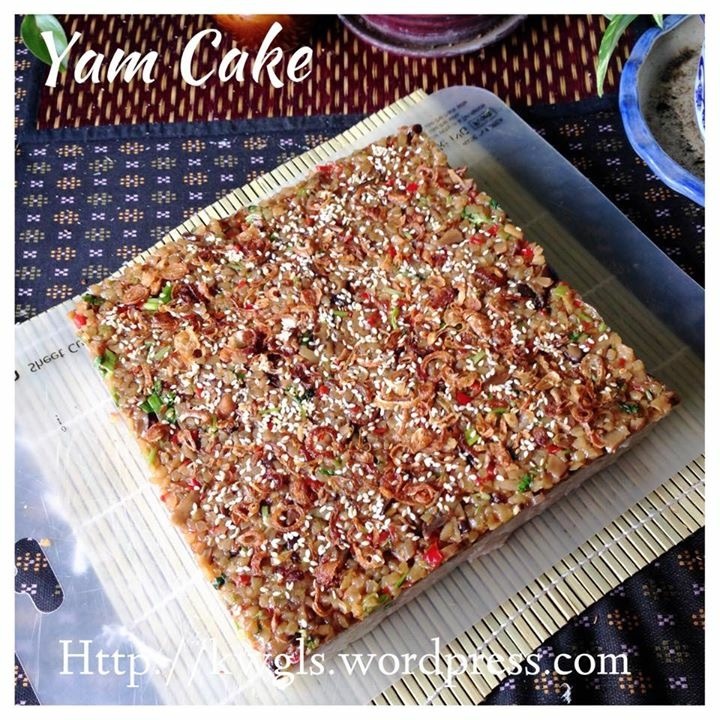 In recent years, the cake has become a common breakfast or snack item among the Singapore and Malaysian Chinese. 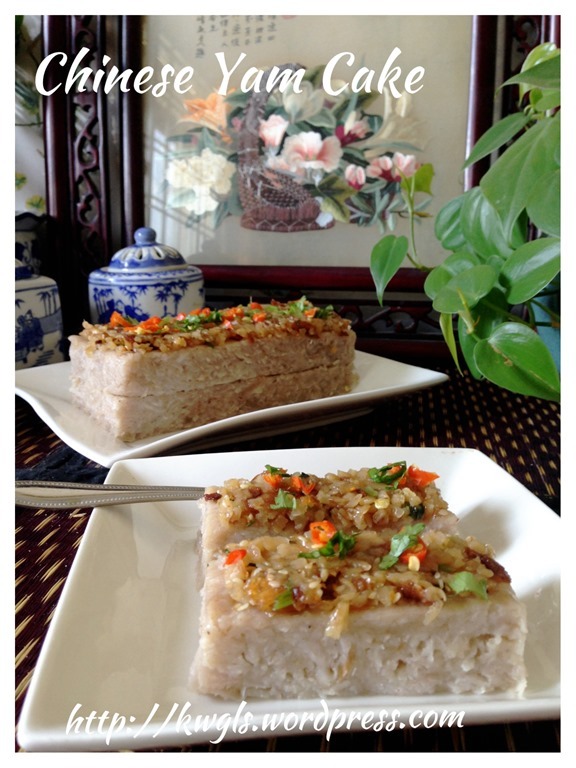 Most households will know how to prepare this traditional Chinese yam cake and every household will claim that theirs is the best. 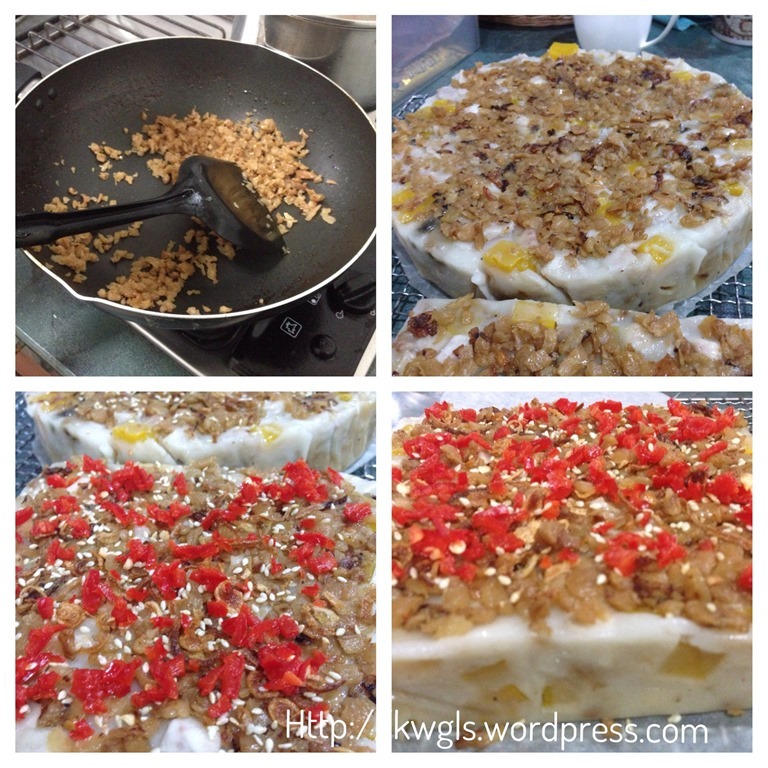 This entry was posted in Chinese and Asian Cakes and Snacks, Food Preparation Series and tagged 8, Chinese Yam cake, Guaishushu, postaday, pumpkin cake, Steamed pumpkin Cake, Steamed Yam Cake， 芋头糕， 金瓜糕. Bookmark the permalink. This is totally different than anything I am used to seeing. I love Chinese food and yams, pumpkins are a favorite. Not sure I would go through all that work to try it but if I see it available in a restaurant I will give it a go. Ooooo…this looks absolutely gorgeous!!! My girl loves it steamed…and deep fried, which isn’t all that healthy, but I don’t mind it either way as long as it tastes good. Btw, what are those in the blue and white things in your first pic? I super-duper love blue & white crockery! It is just some decorating item I bought years ago in China. I used it to keep 5Cents and 1 Cents coin now! haha. Thanks for dropping by. The steam yam and pumpkin cake looks scrumptious ! By the way I would like to know what kind of pumpkin….is it the Japanese pumpkin called kabocha or the western pumpkin orange skin. 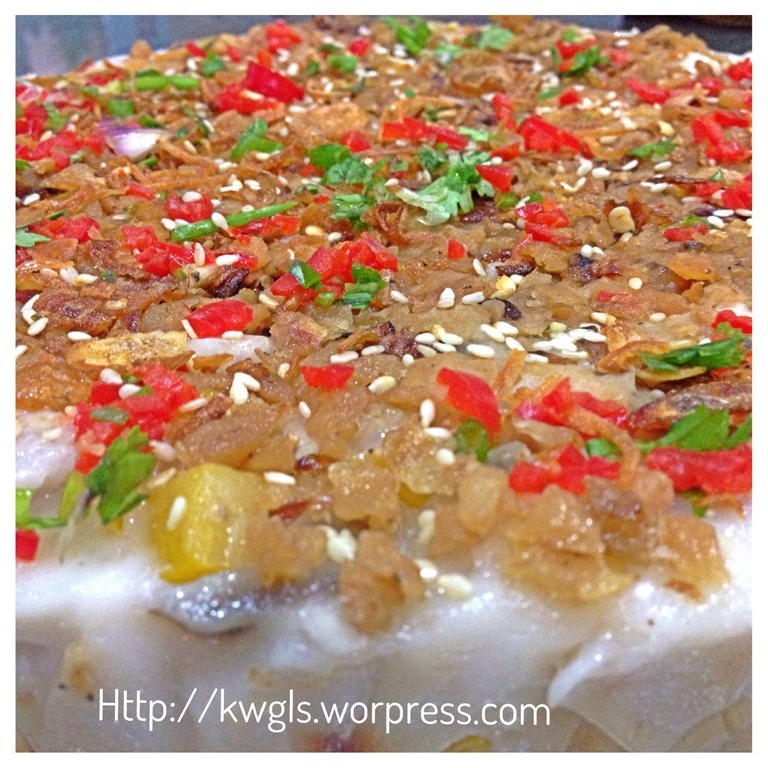 Hi Kenneth, I have a very good Yum kuih recipe to share with you. 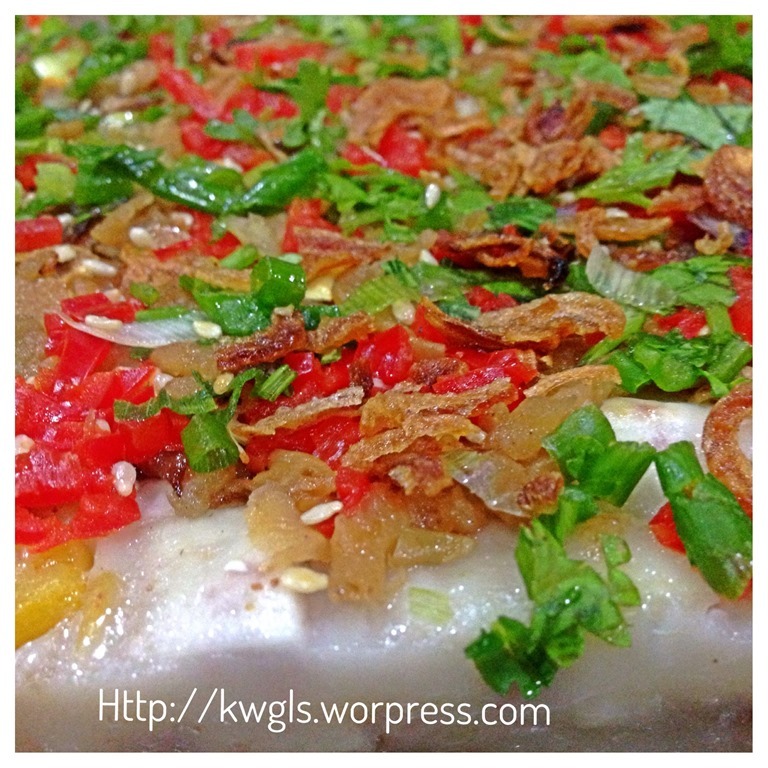 1½ cup of rice flour, ½ cup澄粉, total 3½ cup water. Add in 1 cup of water to mix to a batter then add in 2 ½ cup of boiling water, stir to smooth. After steamed, the kuih will be QQ. Are you from Ipoh as only Ipoh folks use 菜脯. I’m the only one who add it to my yam kuih in Penang. I fry the 菜脯, dried prawns well and keep 1/2 for the topping and the rest into the Yam kuih so that it has very good aroma and tasty. Hi, I cannot eat any grains ie: rice and wheat. Was thinking of substituting the rice flour with sweet potato flour or tapioca flour. Do you think it would work? Thanks! You can but it can be overly chewy. 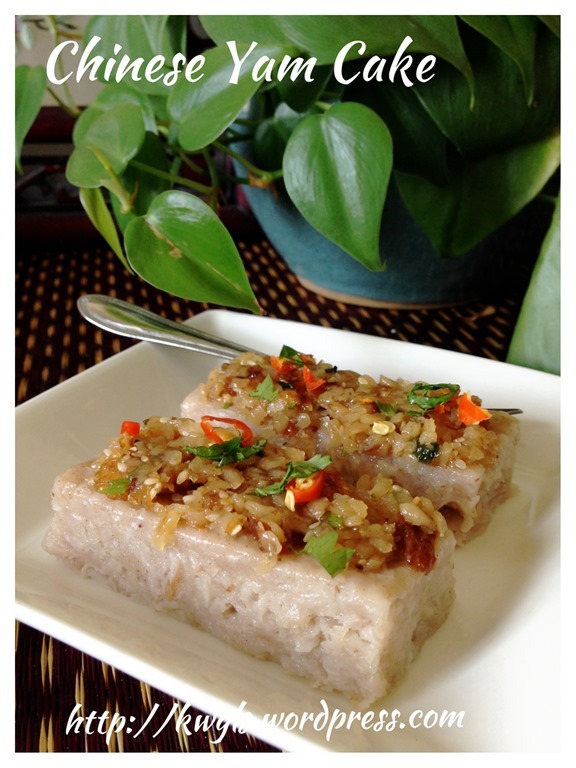 Since you are rice allergy, may be mix with some wheat flour and sweet potato flour. Use more yam as yam in itself will help to hold. Thanks! 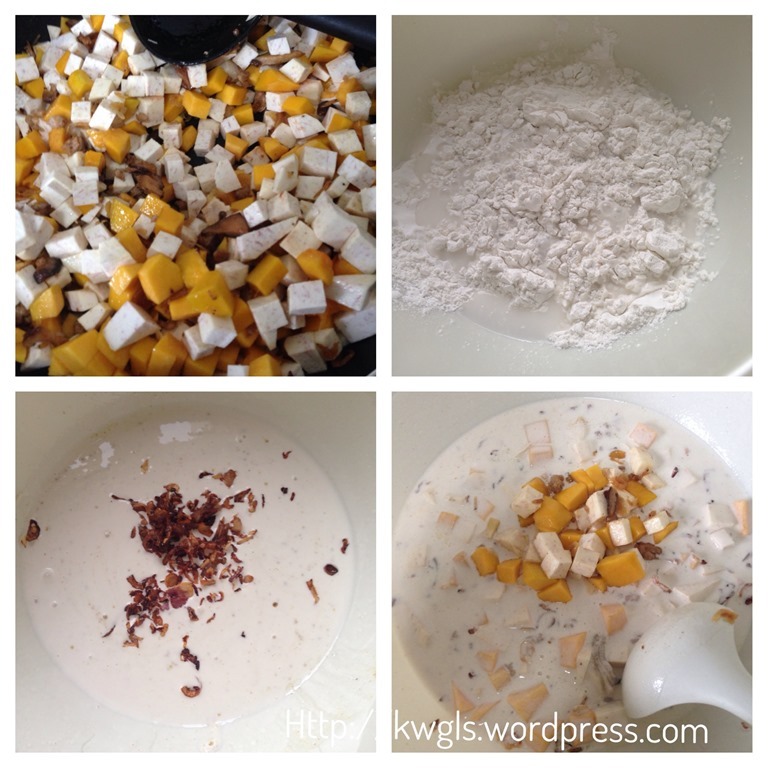 Yes I will put more yam and maybe mix sweet potato flour with tapioca flour (I also cannot take wheat flour). 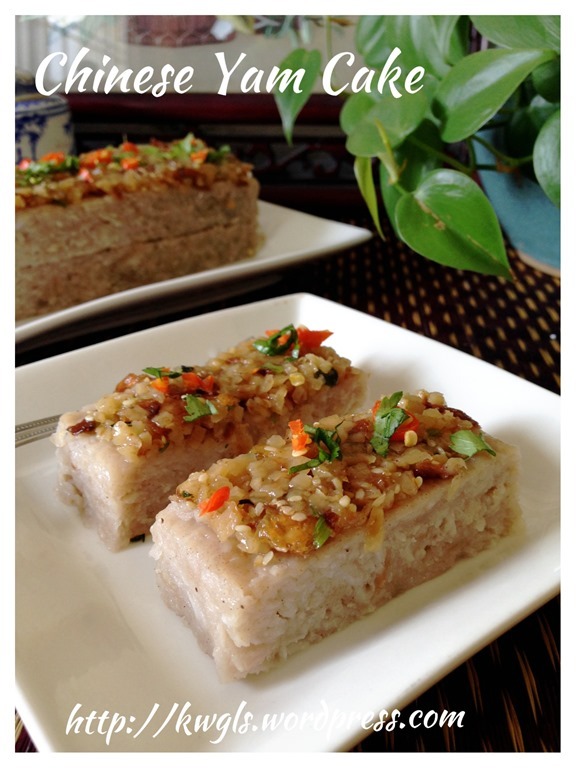 Do you think this can be substituted also for the white radish cake? Thanks so much!